Since there doesn't seem to be a thread dedicated to this fine speaker line, and I am now a Revel F-52 owner I thought it would be a good idea to start an owner's thread for these speakers. 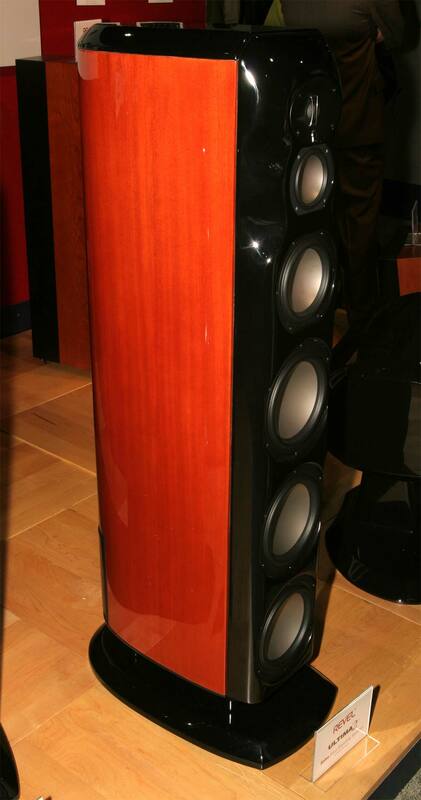 As an introduction Revel was the speaker line of the former Madrigal company which was acquired by the Harman Specialty Group, the high end division of Harman International. The Revel line is most heavily influenced by two well - known designers, Dr. Floyd Toole who earned his reputation at Canada's NRC, where much of the science of modern speaker design was laid out (and where many well-known Canadian speaker companies got their start) and by Kevin Voecks who has won respect for designs at Mirage and Snell prior to coming to Revel. The F-52 I own is the latest generation of the high end model in the Performa line; the middle range betwen the Revel Concertas and Ultimas. A pair of I30's purchased used. I currently have these in storage however I recently have decided to install these in my kitchen. A pair of M-22's which form my bedroom stereo system. These in conjunction with a Squeezebox server form a truly wonderful alarm clock. A pair of Revel Ultima Studio 2's which are replacing the F-52's I have had for 5 years now. Since this is now an official owners thread, we should probably spell Harman correctly. I too was guilty of misspelling it, until I went to work for a Harman company. Any new news about when the new Ultima line will be out? I've heard Fall '06 to summer '07. Harman has remarkale facilities for testing (both listening and measuring) along with some very, very smart people. They have every ability to compete sucessfully (IMO) at any price point, yet very little is heard on this board of Revels. Are they dropping the ball, or are we missing something? Don't know. Their ads seem to be in most prominent magazines and on internet pages as side ads. Could be the lack as readily accessible dealer showrooms. One of the main dealers in SLC had: B&W, Revel, Wilson. B&W sells alot, so they stocked nearly all models. The Revels either aren't pushed as hard or something and didn't move product so they were hardly stocked. They didn't have any Ultima or Performa (pre-Concerta days) in stock or setup to listen to. Had one pair of M20's used that they were selling but they were piled in a back corner hard to see or get to. Finally after some nudging I convinced one sales guy to hook them up to listen to. Sounded great. So I started checking into the brand more. This was about the time I started working for Harman. In the audio wasteland of Houston we have 2 Revel dealers (per thier site), both custom installers. I doubt they have any place or speakers to audition. I should point out that recently within the last year or so, another dealer north of SLC has picked up the Revel line. He's an integrator/installer as well. He used to just carry Energy. He has an Energy room and a really nice Revel room. Right now he has Concerta F12s, with a C12 and dual B12s. He had Performa S30s for the back until the Concerta S12s were in stock. He was driving it with a Lexicon MC-12 pre and a LX-7 amp. It sounded truly remarkable. The room was accoustically tuned very nicely. Before I decided to buy into the Revels I auditioned a fair number of speakers - I found it harder to get an audition for Dali or Dynaudio yet those brands seem to be mentioned at least as much if not more. It may be that Revel isn't thought of as much as a lot of brands simply because the brand hasn't existed that long. I have Revel F30's and C30, since 2001. The dealer I bought from had quite a few models on hand and availble for audition. Unfortuantly, since then, they've picked up B&W, and the last time I was there (been over a year now) they pretty much had no Revel stock on hand. There story was B&W's superior dealer support, supply availablity, etc (there were some issues for a while with backlogs and whatnot). When the F32 came out it took me a while to even see one, but as it turns out when I finally did (in another town), the dealer there had a decent setup of Ultimas and All models of Performa (this was 2 yrs ago). They also had just opened (or bought) a branch in Tampa (where I live), though I don't know how it's done since. I would have thought there would be much more talk out since the intro of the Concerta line (as many AVS members are looking for more "value priced speakers"), but I really haven't seen it. I'm still happy with my Revels. I'm also looking forward to the rumored introduction of the replacements for the Ultima line sometime around the end of the year/beginning of next. They have been pretty much unchanged since coming out in 1999 (I think). Besides being a nuetral, dynamic speaker, there are many things to appreciate about Revel. Among them is the large number of favorable reviews from reputable reviewers, including many with measurements. This is a good thread; I hope we can keep it going. I know my dealer isn't that thrilled about the Concerta - I think he sees it as a sign that Revel isn't as committed to the higher end models (i.e. Ultimas) as he would like which he thinks should have been refreshed before the lower end models were. I think right now sales of the Ultimas would have to be hampered by people deciding to wait for the new model to come out. I haven't listened to the F-12, but I was definitely considering buying the F-32 instead of the F-52. Now that I have had the F-52 at home I am pretty sure I would have been perfectly happy with the F-32 also. But that is not to say I have any remorse about the F-52. It is a spectacular speaker that I am sure I will keep for a long time. I thought Revel was kind if in a hullabaloo about a year ago when the Madrigal group got moved fully under Harman and moved to the Harman HQ in the east coast I believe vaguely? I believe the Revel dealer in Seattle dropped the line and Madrigal all together I believe because they were unable to get product or something like that. That, and the fact that Revel is a fairly new brand, I think is why it's not oft-mentioned. They also used to start at a relatively high price bracket, which makes it not nearly as popularly available, because it is a "high end" brand or a brand for those with means. I believe the concerta series is quite new, as previously the performa M20 were the cheapest speakers they offered at about $2K for the pair. In general, there are far fewer people buying $2,000 bookshelf speakers than many other brands that have full lines well below that pricerange. I have been a Revel fan for many years and look forward to seeing the new Ulttma series. My current HT system consist of Ultima Studios, Voice, Embrace, Performa B15 and M20 speakers. Up until a couple of months ago, I also had B&W 802D, HTM2D and 805S in the same room. After a few months of alternating speakers, I sold off the B&W speakers and kept my Revels. The Revel and B&W are both great speakers but despite its age, I preferred the Revels over the B&W in my room. I was fortunate enough to pick up a pair of F50's from an engineer who worked for Madrigal and now works for Revel when he upgraded to the F52's. These speakers are still great! I'm using them in a dedicated two channel room and find myself drifting there instead of my home theater room much of the time. FWIW, when I tried to audition Revel speakers in the Washington DC area several months ago, I went to a local dealer listed on the Revel web site. When I walked in, I asked if they had any models of Revel I could audition but got a surprising response. They said they only list the Revel speakers on their web site as a means to retain their Levinson franchise. They quit stocking Revel after they were acquired by Harman, but would special order them if the customer desired. Their tone was a bit condescending toward Revel. I don't know if this is typical or not, but it certainly doesn't help Revel sell speakers. I'll weigh in as a proud new owner of the F-12's. I listened to just about everything I could find in my price range (Paradigm, Spendor, B&W, Dynaudio, Totem, PSB) and ended up going with the Revels. I did listen to the F12's and F32's side by side and I have to say, there was a pretty noticeable difference and I definitely liked the F32's better. But, that being said, given that the F12's are roughly 1/3 the price of the F32's, they were more competitive with the F32's than they had any right to be. Bottom line, wonderfully clean, neutral, dynamic speakers that exceeded my expectations at that price point. I think the Concerta line was kind of an opportunity knocking type thing. I think they took notice of the price point where most brands are getting a lot of their stable income from. Seeing they had nothing in this range they leveraged existing products to create it. They were able to take the existing Beta series (Infinity) cabinets toward the end of the Beta life span, modify it, and cost reduce parts where possible. They cost reduced some parts of the drivers and crossovers without greatly affecting the Revel sound quality and came up with a great sounding speaker at a more attainable price point. Now that they have an opportunity for higher volume sales and perhaps more stable income, they can continue working on the best attainable sound in the Ultima line. That sort of parallels my own assesment - I auditioned 803Ds during my search, and ended up deciding on the F-52s. The 803Ds were good - but I thought the Revels resolved things a bit better. I also sold of my B&Ws to replace them with Studio's....never been happier. It will take a hell of a speaker to make me think about upgrading. I use M20s for rear speakers in my HT and was really impressed with them when I moved them to my bedroom system for 2 channel dutues for a short while, it seems that the whole revel range form top to bottom is quality. New Ultima2 line shown at CEDIA. Not much details yet. Boy, do they look different! I kind of like the looks of the three-way monitor (the new Gem, I'm guessing). The Salon will take some getting used to. The Voice center looks kinda cool but I think the old Salon/Studio looks better and has a unique design. The new Salon/Studio looks too much like the F52. I am just trying to find excuses not to upgrade to the new Salon/Studio . OK I found a press release describing the Ultima2 series. Beryllium dome tweeters. Still using Titanium inverted domes. No pricing, except the 22K mentioned in the Cedia blurb from UAV for the Salon2. Revel's Kevin Voecks shows off the company's new Ultima2 speakers, including the Salon and the smaller Studio. Other Ultima1 models are described in our day 1 report. 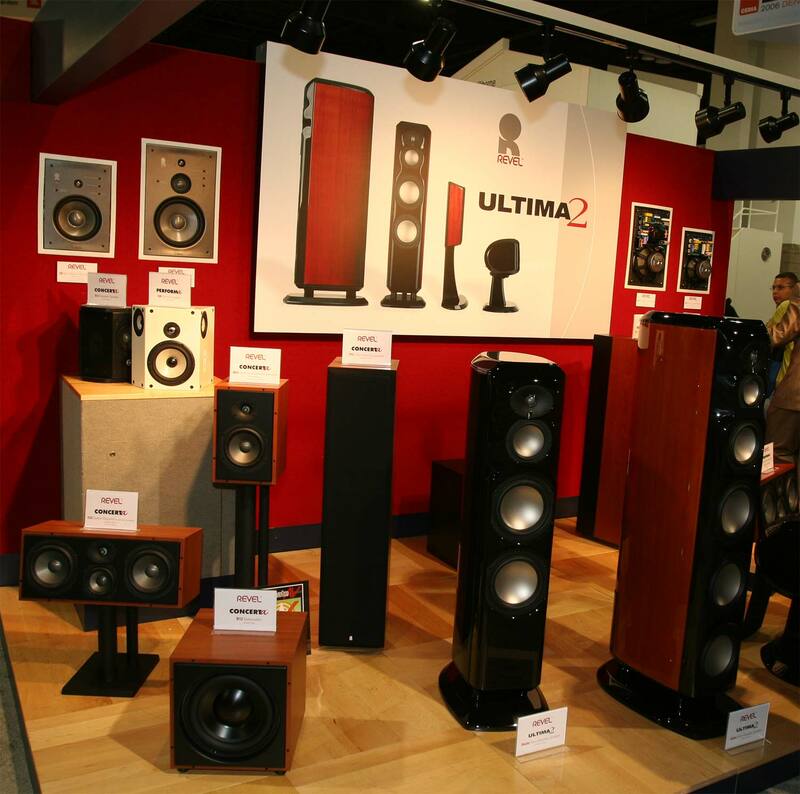 All the Ultima2 speakers are completely redesigned from the original Ultimate line, including all new cabinets, drivers, and crossovers. The new Ultima tweeter sports a waveguide and a beryllium dome. Even in a less than optimum room at an of-site demonstration, the sound was Revel-itious. When I put our home theater together two years ago, I listened to many speakers. I found the Revel speakers to be very neutral, to image very well and to let the music be "seen" for what it is. I ended up getting the F50s, the C50, the B15a and the S30s. I really love the whole ensemble. We are now remodeling our home and going more traditional in style - wood floors, crown moldings/baseboards, etc., compared to our more contemporary current style. Our current sycamore and gray current Revel speakers will not work with our new look. I called Mission Audio/Video here in Santa Barbara and they said Revel was coming our with the new Ultima 2 line and would be launched at Cedia 2006. I am delighted that the new Ultima 2 line is more traditional in design and the Mahogany will go very nice with our new wood floors that we will be installing. Has anyone at Cedia heard the new Ultima 2 line? Let me know. Perfection lies in the details! The new Salon / Studio look quite interesting. From what can tell they will work in quite a few more rooms than the old versions. It is also interesting because my dealer thought that only the studio model was going to remain after the redesign. I can't wait for the reviews to trickle in. I still haven't seen anyone post (anywhere) on hearing the Ultima2 line. While waiting, I stumbled across this interview in CE Pro with three speaker designers, representing Thiel, Aerial, and Revel. The Revel interview is with Kevin Voecks (pictured above with the Ulitima2 line); and is the last of the three interviews in that article. Not exactly a subjectivist, is he? His comments about most people preferring the same speaker in DBT are quite interesting. OK. The Salon2 demo was outstanding, easily one of the 3 best sounds at CEDIA, even if that is not saying much. How do you feel the Salon 2's compare to the current Salons? What were the other "two best sounds" at Cedia? Let us know. That AV Guide video is pretty cool as Kevin himself talks about and shows off the new line. The Studios and Salons are very compelling products. The Be tweeter coupled with the elliptical waveguide will be excellent. The Ti inverted dome drivers represent a great advance in the already exciting nontweeter deployment of Ti in transducers.